Google’s Chromecast takes a different approach to the video streaming craze that has hit in the past decade. More people are utilizing streaming services, so companies are looking to capitalize on this growing trend. Google, not to be outdone, released its answer to streaming set-top boxes: a thumb-sized, “over-the-top” option called Chromecast. 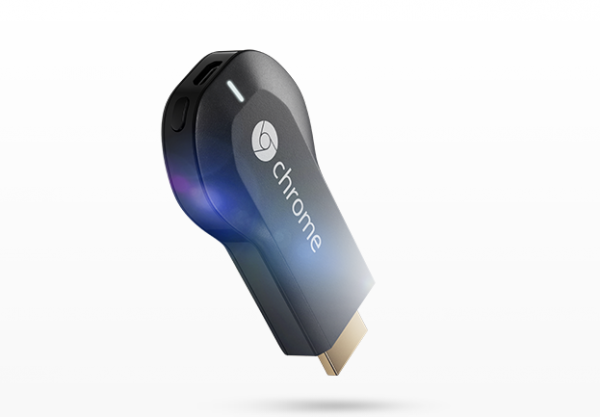 Chromecast plugs directly into your TV via an HDMI port. Its power source is either the TV’s USB port or a wall outlet, and the Chromecast will come with a USB cable and power adapter. Using your Wi-Fi connection, the Chromecast directly stream content in two ways to your television. Chromecast uses mobile or web apps to stream content, or it uses “tab casting” to display just about any content you pull up on the Google Chrome web browser on your computer. The Chromecast is a small yet powerful device, retailing at about $35. At only 2.83 inches (72 mm), Chromecast can still power an output of up to 1080p, which is high-definition. You use your PC or mobile device as your remote control. Supported operating systems for Chromecast include Android 2.3 and higher, iOS 6.0 and higher, Windows 7 and higher, Mac OS 10.7 and higher and Chrome OS on a Chromebook running Chrome 28 or higher, so if your device runs on any of these, you will be able to use Chromecast. To stream content to your TV, Chromecast primarily uses mobile apps, both Android and iOS, and web apps running on computers using Google Chrome browser through an extension you can download for the browser. Because of the way Chromecast operates, which is streaming content from the Cloud rather than directly to the Chromecast, you can still use the device you are streaming content from for making calls or using other apps without disrupting the streaming process. With Chromecast and its apps, you can watch movies, TV shows, videos, sports and listen to music. Some of these apps include WatchESPN, Netflix, Hulu Plus, HBO GO, YouTube, Pandora, Crackle, Rdio, MLB.TV Premium, MLS Matchday, Crunchyroll, Red Bull TV, VEVO, Songza, and more as well as Google Play Movies & TV, Google Play Music, and Google+ Photos. Once you get these apps linked to Chromecast, initial setup is complete within minutes. Similar to Chromecast, the Roku Streaming Stick is also a small HDMI-enabled device, powered through a USB port, that you plug into your TV to stream content to it. At first, one of the primary differences was that Roku started out with a large number of channels, which Chromecast didn’t have at the time. Over time, Google has added more channels and is catching up. The two differ the most in terms of control and how they each stream content. To watch a video on YouTube using Roku, run the YouTube app through Roku’s onscreen menu and find the video you want to watch. Chromecast enables the user to access the YouTube video using a desktop browser or YouTube mobile app, and then the user selects the Chromecast icon that accompanies the video, which then streams it to your TV. Instead of using the Roku menu onscreen, Chromecast requires you to use your mobile device or PC Web browser as your menu. Chromecast stands on its own in terms of external over-the-top devices used to stream content to your TV (as opposed to set-top boxes). It’s smaller than typical boxes, which makes it more portable from one TV to another, but it doesn’t yet have all of the apps that other streaming devices do. Google Chromecast is just one example in a sea of choices of how to use a TV-watching system that is growing in popularity each year.